So a good night sleep is what again?? I can't remember what that is or when the last time was I had one. With Peanut and Angel up several times during the night it seems like we have not had a good night sleep in years. This momma is wearing thin and so is dad with such little sleep. When Angel slept in our room we always had our sleep machine playing and she seemed to sleep well. When we moved her into the big girls room she started waking all the time again. 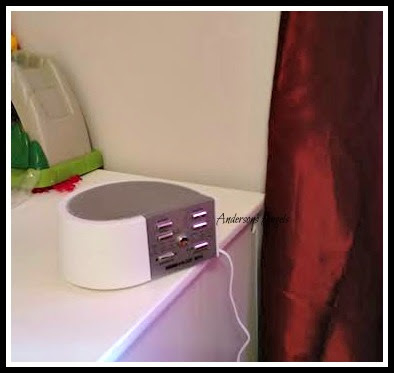 When I got the opportunity to review a Sound of Sleep mini machine I was super excited. I put it in the girl's room and they both have been sleeping much better. Best way to describe this machine to you? It's a parents saving grace if your kids like nature or noise sounds to sleep to. Since getting the Sound of Sleep mini machine not only is Angel and Sweet Pea sleeping better through the night so is this momma and dad. Angel still wakes up a few times a night but we went from every hour to maybe one or two times throughout the night. We take this with us on any trips we go on now and leave our big one at home. It helps drown out noises and creates a calm and relaxing setting, plus the small size makes it easy to pack in your suitcase. I love all the different sound settings that you can choose from on the Sound of Sleep mini machine. The girls both have their favorites so they take turns each night on which one we will put on for them. One feature that we like is the adaptive button that you can turn on so the sounds will get louder to drown out any noise in the room which is nice for when your in a hotel and the room above you decides to have a dance party or something. How would you like to own a Sound of Sleep mini machine for yourself or to give to someone you know who is in need of a goodnight sleep?